Courtesy of Nelson and Pade, Inc. Innovative gardening techniques have revolutionized the way we approach growing food. For instance, hydroponic gardening, or gardening without soil that suspends plants’ roots in a water and chemical nutrient mixture, is efficient and well-suited to gardeners who lack large plots of land. For homesteaders off-put by the chemical aspect of hydroponics, there’s aquaponics, a closed loop freshwater system for soilless gardening. 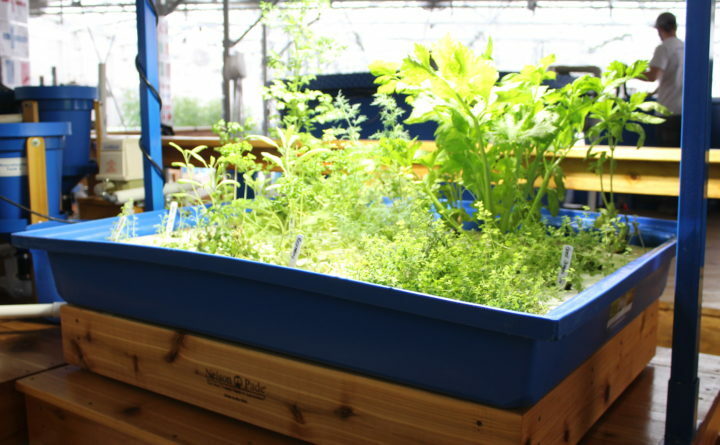 The design element of aquaponics is slightly more challenging, but by adding fish to the growing equation, aquaponics creates a mini-ecosystem that will delight sustainability enthusiasts and creative gardeners alike. The primary difference between hydroponic and aquaponic systems is that the latter uses fish to supply nutrients to the plants instead of chemicals. Fish in successful aquaponic systems can also be eaten. Most freshwater fish can be used in an aquaponic system. Filipowich says that the most commonly used fish in aquaponic systems are tilapia because they produce lean meat, are easy to grow and have a high tolerance for different water parameters, though some aquaponic systems use trout, perch or catfish. If you are not interested in producing edible fish, goldfish and koi are also easy to manage. Like hydroponic systems, aquaponic systems are suited for drought-prone, mountainous and urban areas because they are water efficient and do not require working soil. But unlike aquaponic systems, the nutrients in a hydroponic system must be added manually, and they are often made from non-renewable petroleum by-products. Hydroponic systems also require waste water discharge every few months. Aquaponic systems are more self-regulating. “Your nutrient input is just fish food, so just depending on where you’re getting your fish food, it’s more sustainable,” Filipowich says. Aquaponic systems, however, a more complicated than hydroponics systems and require a certain level of scientific acumen. Aquaponics also generally require more space than hydroponics so that the fish can thrive. The costs of starting an aquaponic system are also often higher than their hydroponic counterparts. “Because the industry is so new, there are not a lot of places to get the materials, so the upfront cost is going to be pretty big,” Filipowich adds. Nelson says that you must use food-grade plastics and National Sanitation Foundation certified pipes to avoid chemicals leaching into the water. Because the design specifications are so particular, creating a DIY aquaponics system is challenging. “A lot of people try their own and find they don’t work well,” Nelson says. If you are purchasing your first home system, Nelson says recommends one that is a couple hundred square feet: “400 to 600 [square feet] would be great for a small family,” she says. “It will produce all the vegetables you need.” Your aquaponic system will need access to power for components like pumps, aerators and filters, and you may also need a heater to keep the fish at an optimal temperature.